Please enjoy this free set of digital paper. 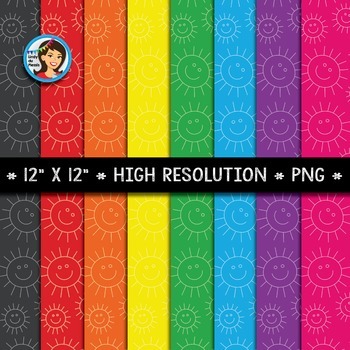 The bright rainbow colors are sure to brighten your classroom or teaching projects! 8 Commercial use 12" x 12" high-resolution sun themed digital papers. Each sheet is a 300 DPI image, great for printing. Copyright 2016 © Lindy du Plessis; All Rights Reserved.